We bought it this summer off craigslist. 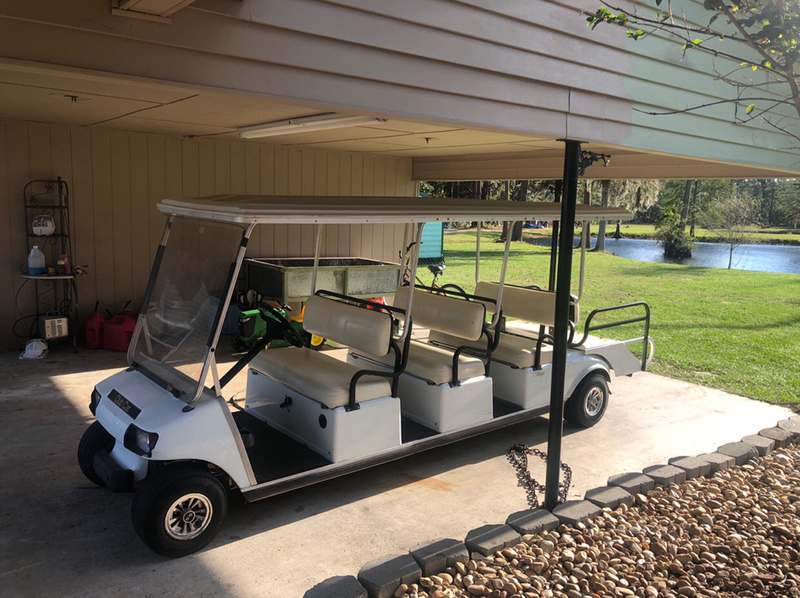 I always wanted a golf cart to ride around our block (it's actually a big circle about 3/4 of a mile around) but when this one showed up, I knew we had to have it. It was a valet cart from a local casino. It rode strong, but was well worn and weathered. That just meant I had to give it a facelift. After about 2.5 months of weekends and a near complete teardown, it's everything we hoped it would be in the end. Here is an imgur album of some of the shots I took along the way. That looks great. Will you take mine and do the same :-)? Those things feel interesting to drive, don’t they? It’s like you’re moving straight sideways when you turn. If ours looked that good as yours when we bought it I wouldn't have spent the time and money to refurb it. Everything on ours was tan colored and everything was weathered to hell. It almost looked like something that saw combat in Desert Storm. I've only driven ours a handful of times, the wife has probably a hundred laps around the block at this point, lol. The turning radius is... interesting to say the least. There are two cul-de-sacs on our circle and if you want to go around them you have to do the kinda "you gotta turn out before turning in" thing if you want to make it around without having to do a little reverse jig 3/4 of the way around. I like the work you did on yours. You don’t see these very often. I got mine from a boys school locally that was upgrading. Crazy thing is is they “upgraded“ to a Chinese Fairplay. Our family is 11, so that’s what it gets used for now. It wasn't that bad if you are good with tools and staying organized with the parts you remove. I did the "Red Solo Cup" system and labeled the cups with a sharpie and put all the nuts and bolts from one section into it with a WD-40 bath. One of the worst parts was the seat bottoms. All the hardware had to be removed before they could be reupholstered and most of them were rusted out and had to be drilled off. The "T-Nuts" embedded in the wood were a real PITA and I had to remove many of them and put in new ones using a wood epoxy to hold them in place. The alternative was to trace and cut all new wood which didn't seem necessary with everything else I wanted to get done too. The only real "hitch" we ran into is that while I was working on it and tearing it down, the Tour Max tires went out of round because it sat in the garage for almost 2 months. On the maiden voyage we were like, "Why does it bounce now?" I called a local cart repair company and they made a home visit and brought 4 stock steel rims with used, but good condition tires on them to swap out. Once they did that, it was like, "Oh NOW we are talking!" It was back to riding smooth again. 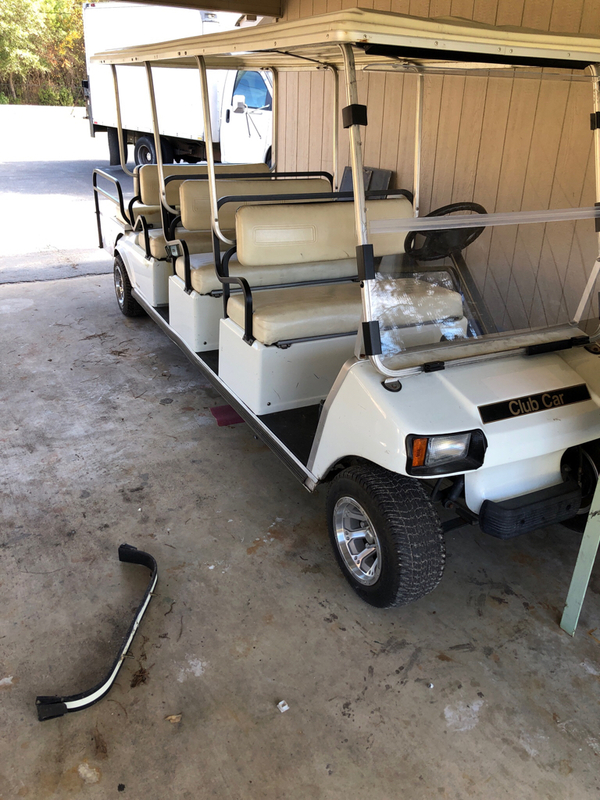 We are going to leave those rims and tires on it while we decide which brand/type of tires we should buy that won't go out of round like the Tour Max ones did. I've read that the out of round tires *might* be able to be rescued if I deflate them and leave them outside on a hot sunny day and then re-inflate them to like 36 PSI while they are still warm. I'll give that a try come springtime before we buy new tires. I really prefer the ITP 10" rims over the stock 8" steel ones.